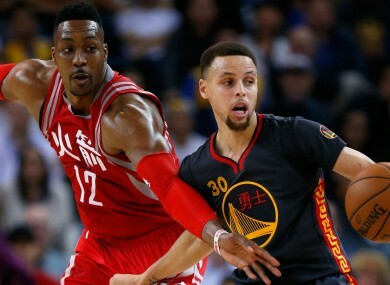 Stephen Curry and Dwight Howard during last night's game. THE GOLDEN STATE Warriors broke the record for the best 51-game start in NBA history thanks to a 123-110 win over the Houston Rockets on Tuesday. The Warriors, 47-4 this year, still have the best ever regular season record in their sights, needing to go at least 26-5 to surpass the Chicago Bulls’ 72-10 record in 1995-96. Another three straight wins at the Oracle Centre would also see the Warriors break the Bulls’ record of 44 consecutive home victories. Andrew Bogut put in an impressive showing with 13 points, 11 rebounds and a season-high six blocked shots while Steph Curry had 35 points, nine assists and six rebounds in their 13-point win over the Rockets. James Harden top-scored for the Rockets with 37 points, despite a scoreless first quarter. Despite the big win, the Warriors were not happy with their performance. “We can definitely play better and just sustain our level of play and be more consistent over 48 minutes. It’s hard,” Curry said. Email “Warriors break yet another NBA record as Steph Curry continues to do ridiculous things”. Feedback on “Warriors break yet another NBA record as Steph Curry continues to do ridiculous things”.